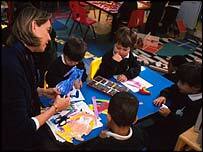 The NUT opposes replacing free nursery education with "educare". 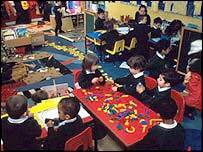 The biggest teachers' union says it is worried by plans for more centres for children aged under four in England, especially those based on schools. Leaders of the National Union of Teachers support the idea of offering a range of services in poor areas. But they say the government's plan raises issues of staffing and funding. Some delegates at the union's annual conference suspect the whole "educare" scheme is "a ruse" aimed at having more lower paid, less well qualified staff. The conference, in Gateshead, is debating on Monday a resolution from the union's national executive which calls for education rather than childcare to be the priority in early years centres. It agrees with the government that research suggests good quality early education can lead to better attainment for children in their later schooling, especially those from poor homes. But the NUT leadership says that if the government is serious about seeing this happen it must "prioritise high quality early years education" - and invest more. It opposes replacing the 12 and a half hours a week of free nursery education to which children aged three and four are entitled with "educare". It says having childcare outside normal school hours can be valuable - to pupils and their parents. But this raises questions about staffing levels, health and safety, funding, pay and conditions. It seeks to ensure that education and care are provided by "trained and experienced professionals and support staff". And it wants schools themselves to be free to decide whether they can develop out-of-hours services. The government has said it wants to see schools offering activities from 8am to 6pm. Money the chancellor mentioned in his Budget for rebuilding half of England's primary schools over 15 years is intended to fund this. Teachers in Croydon, south London, are seeking a statement from the NUT conference that "the term 'educare' is a ruse" to extend the government's modernisation agenda for schools. This involves using support staff to reduce teachers' workloads. The NUT opposes their taking lessons without a qualified teacher being present.